So if you are like most young professionals, then you are just starting to get settled into your career and are perhaps living paycheck to paycheck, with fingers crossed you don’t overdraw on your bank account this month. Without proper budgeting, this happens to more people than you think, and I’m sorry to say, but as your income starts increasing, this issue will not fix itself until you get a firm handle on how you spend. There is a myth out there we must burst before going any further – budgets are not a bad thing! Budgets are not restricting or limiting, but instead think of them as liberating and controlling. By having a balanced budget, you are able to live comfortably within your means and not worry about that $35 overdraft fee each time you go over in your bank account. To begin your budget, you first need to figure out your total annual income (I always use the number on my paycheck, after taxes have been taken out, and multiply it by the number of pay periods in a year). This first step creates a pot of money you can spend throughout the year. Next, figure out your expenses. You do not need to use complicated software for this – a simple budget worksheet will be fine and you can find these usually for free on the internet. Once you have a blank budget in place, fill in your take-home income and subtract your expenses. When entering your expenses, be realistic on your spending. If you spend $300 a month going out with friends to dinner and bars, then write $300. Your budget should reflect the life you want to live! After all of your expenses have been subtracted from your income, then hopefully you will have a positive number. If that number is negative, then there is the reason you are seeing an overdraft fee in your bank account every month! The good news is there are ways to change this and make it so you are in the positive each month. 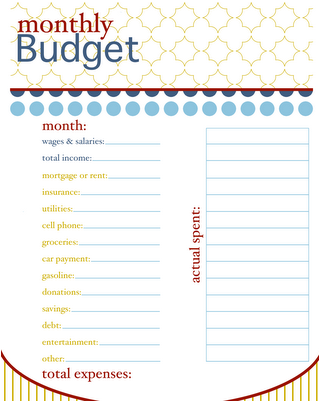 Example of a basic monthly budget sheet. In the world of financial planning, we use two terms when talking about expenses – nondiscretionary and discretionary expenses. Nondiscretionary expenses are those essential expenses you must have to live – rent/mortgage, utilities, groceries, transportation and health insurance for example. Discretionary expenses refers to extra spending that can be altered to live within your means – entertainment, memberships, retirement contributions, charity, personal care (hair/nails), gifts and vacation. If you see a negative number in a budget, then it is the latter where you should start cutting back. Maybe it’s your biweekly mani/pedi that’s causing you to go negative each month. If this is the case, then buy a bottle or two of nail polish and do your nails at home. There are a million ways to cut on those discretionary expenses, but it must be tailored so you’re still happily living a life you want and can afford. If you are like me, I put everything on my credit/debit card so at the end of each month it is hard to determine how much I am spending. Luckily, there is an activity I want each of you to do for the next two weeks which should (hopefully) help crystallize your spending habits and patterns. 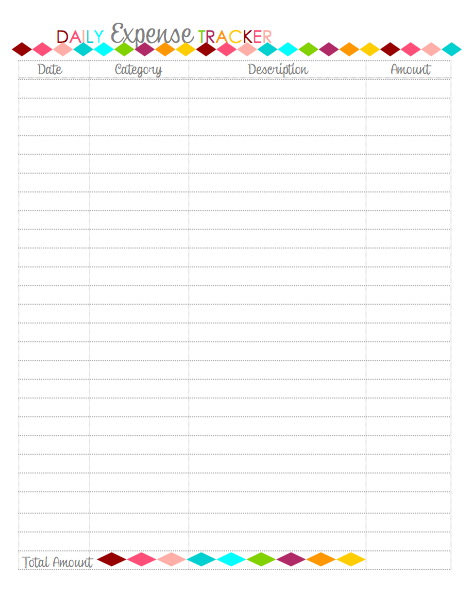 Get started tracking your expenses with this simple worksheet. Here’s the challenge: Everything you buy for the next two weeks, write down. This includes that Pumpkin Spice Latte from Starbucks (yes the season is here), UBER rides, drinks at the bar, dinner with the girlfriends, etc. Carry a small notebook around and write everything down. After two weeks, separate these different purchases into categories and you can then figure out how much you are spending in each category. I think you will be shocked when you see how much you are spending on mundane things that are not necessary. Hopefully the shock factor will be all you need to start bringing down your discretionary spending. Remember that budgets are not a bad thing, but are here to keep us in line and living the life we want while still keeping control of finances and avoiding that bank overdraft fee. Look here each month for advice on financial matters targeted to you. To help ensure I address all areas that might be of a concern, I invite you to email me with your financial-related questions and concerns, so I can help incorporate these into this monthly column (Elizabeth.paal@LFG.com). I’m sure if you have a financial question, your peers will have the same question. Elizabeth Paal is a registered representative of Lincoln Financial Advisors Corp., a broker/dealer (member SIPC) and registered investment advisor.